Monitor Tests Forum > 1080p @ 144 hz on 1440p monitor and AMD card - can't get full screen scaling??? So this Acer monitor has a 1440p native resolution and supports up to 165 hz (when activating it's 'OC' mode in the monitor's OSD), otherwise 144 hz. Whenever I try to run a game with a 1080p resolution @ 144 hz, it will not scale up the image to a full screen no matter WHAT I try within the AMD Radeon driver or the monitor's OSD. It's like the scaling option is stuck to "Scaling Mode: Center"
My GPU scaling option within the Radeon drivers is currently set to 'off' however it doesn't matter if I set it to on and pick any of the scaling mode options. It won't scale it to fullscreen. There's also an OSD option on my monitor: 'Wide Mode' can be set to either Full, Aspect or 1:1. Changing these options has actually never changed the image I'm seeing on my monitor and I've tried it while in-game, on desktop, using different resolutions / hz so I don't even know why the option is there when it's not doing anything. I'm running 1440p at 144 hz as my native / desktop resolution. As soon as I decrease it down to 60 hz within Windows display options, the whole GPU scaling will work perfectly fine and I'm able to play 1080p enlarged to full screen , but with 60 hz only. Whenever I increase that to anything above 60 (I have 85, 100, 120 and 144 hz available in the dropdown), it won't scale the image and I end up with the configuration you see on my screenshots. I will also add that if I pick a 4:3 resolution of up to 1024x768, everything will work just fine as well (I'll have a 'full screen' with black bars left and right only, running at 144 hz, which is just the way it should be). Does anyone know how to fix this? I'd be very very grateful... thanks ! 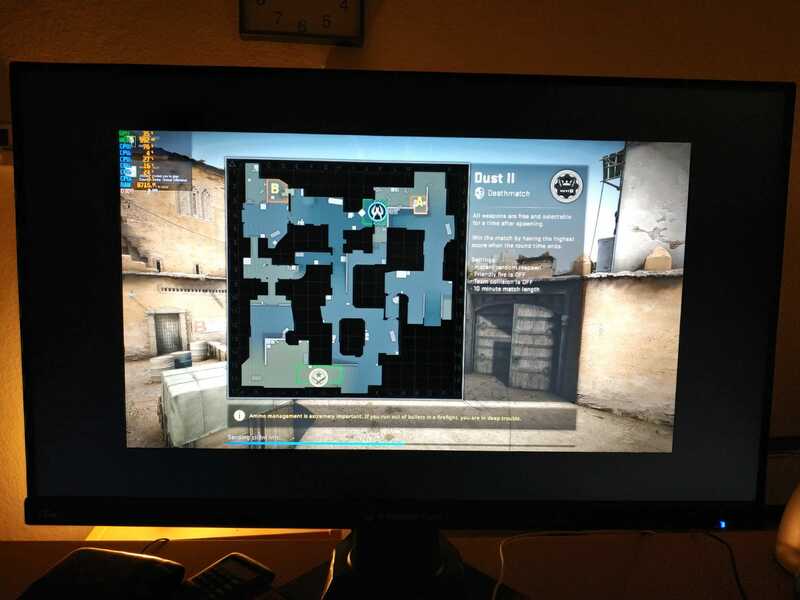 RE: 1080p @ 144 hz on 1440p monitor and AMD card - can't get full screen scaling??? I remember AMD's driver having issues with GPU scaling at certain resolutions, especially at higher resolutions/refresh rates with older cards like the R9 280X. Newer cards like the RX 580/570 seem to have less issues scaling with the latest drivers, so it might be a hardware limitation of older cards. I don't know why the monitor would have a "Wide Mode" scaling option because G-SYNC monitors usually can't handle non-native resolutions without GPU scaling. If the monitor can actually scale 1080p @ 144 Hz itself, you'll have to add it with CRU to use the monitor's scaling options. (04-13-2019 12:38 PM)ToastyX Wrote: I remember AMD's driver having issues with GPU scaling at certain resolutions, especially at higher resolutions/refresh rates with older cards like the R9 280X. Newer cards like the RX 580/570 seem to have less issues scaling with the latest drivers, so it might be a hardware limitation of older cards. Thanks, how can I try that out? I have the monitor connected via Displayport, I thought CRU was only meant for HDMI and DVI or am I incorrect? CRU works with DisplayPort, but G-SYNC monitors usually don't support non-native resolutions with DisplayPort, so I wonder why there are scaling options in the monitor. Maybe the scaling options are for HDMI, but you won't be able to get 1440p @ 144 Hz with HDMI. Add 1920x1080 @ 144 Hz as a detailed resolution using "LCD standard" timing. Then restart and make sure GPU scaling is disabled. If the monitor won't display anything when you switch to 1920x1080 @ 144 Hz, then it doesn't support non-native resolutions. (04-13-2019 04:21 PM)ToastyX Wrote: CRU works with DisplayPort, but G-SYNC monitors usually don't support non-native resolutions with DisplayPort, so I wonder why there are scaling options in the monitor. Maybe the scaling options are for HDMI, but you won't be able to get 1440p @ 144 Hz with HDMI. "CEA-861: 5 detailed resolutions, 3 data blocks"
in my Extenion Blocks mean? By making sure I have GPU scaling disabled you're talking abou the GPU scaling option within the ATI drivers right? I did mess around with CRU and also the ATI driver patchers that would remove the pixel clock limits a lot in the past, since I had an old QNIX QX2710 monitor until a week ago when it finally died after a few years of use, most likely because I had it overclocked to 100 hz all the time using CRU + the patcher, which made some components on the monitor's mainboard heat up more than they'd usually do at 60 hz. We took out the mainboard recently and a friend of mine who knows a lot about electronics is currently trying to fix it. Anyways I just wanted to add that since I figured it MIGHT have something to do with the issues I'm seeing right now (scaling not working at 144 hz) but I'm not sure. Also it will scale 4:3 resolutions of 640x480 ; 800x600 and 1024x768 just fine by keeping their aspect ratios so I'll have black bars left and right, which I want. I noticed the 4:3 resolutions that are working are all on CRU at the left side showing as "Established resolutions" while for ex. 1280x960 is not. 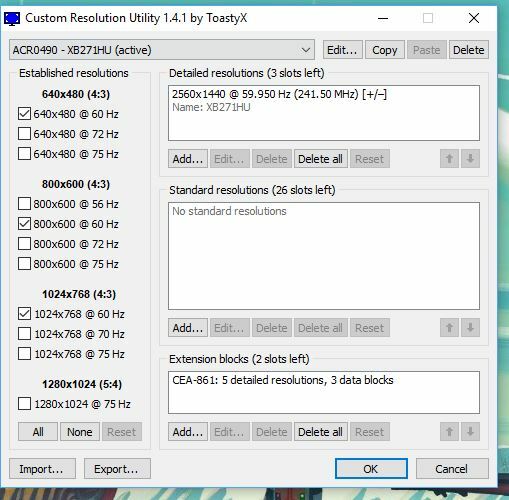 Resolutions listed in CRU are sent to the monitor, so the monitor handles the scaling for those resolutions unless GPU scaling is enabled in AMD's driver. The driver also adds some common lower resolutions as scaled resolutions, so the GPU handles scaling for those resolutions. 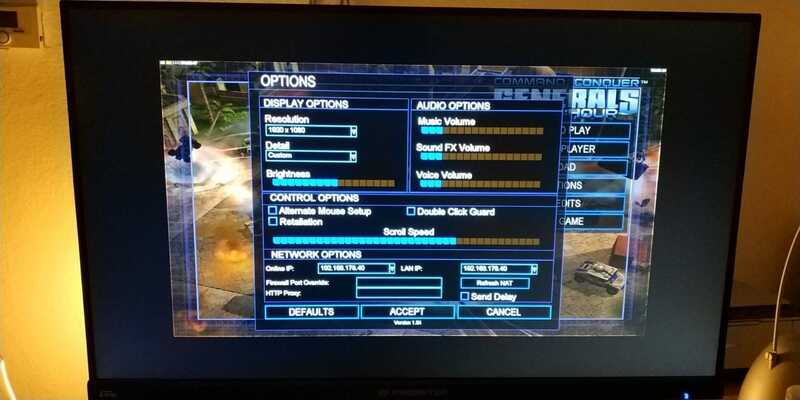 If you add 1920x1080 @ 144 Hz with CRU, it will be sent to the monitor, but as I said, the monitor might not support it. If you edit the extension block, you can see the other resolutions and data blocks the monitor has defined. The pixel clock patcher does not affect DisplayPort or scaling, and it's easy to undo by running it again. Upgrading or reinstalling AMD's driver also removes the patch. As I mentioned, AMD's driver has had issues scaling some resolutions with older cards, especially at higher resolutions and refresh rates, so I'm not surprised by this. Newer cards like the RX 580/570 might not have the problem, but you might be better off getting an NVIDIA card so you can take advantage of G-SYNC, and NVIDIA typically doesn't have scaling problems like this.